You know that lifting weights and running are two tried-and-true ways to make your body strong. A strong body usually means good health, and that’s essential to every facet of your life. Looking a little further, do you know how to make your teeth strong as well (beyond brushing and flossing every day)? They’ll enable you to eat anything you want and have a beautiful smile for many years. Here are 5 simple tips from your dentist in Ocala, FL, Dr. Daniel Weldon, on how to build strong teeth that will last. Cavities are created by the natural bacteria in your mouth eating through your tooth’s enamel. This occurs when the bacteria consumes the leftover sugar on your teeth and creates plaque, which is acidic. You brush and floss every day in order to clean this plaque off. Foods such as sodas, juices, energy drinks, and candy are high in sugar, and accelerates the production of plaque in your mouth. You don’t need to give up sugary treats entirely, just enjoy them in moderation. Foods such as milk, cheese, and yogurt are rich in calcium. When you eat them, this calcium actually deposits on your teeth, replacing the minerals that have been worn away by plaque. 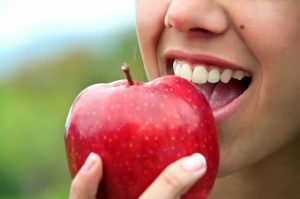 By enjoying these foods every day, you are building your teeth up in a very small way. Yes, you can brush and floss your teeth too much or too hard. It can wear the enamel right off of your teeth. Be sure to only brush twice a day, and avoid brushing right after eating acidic foods like sweets or citrus fruit. They soften your enamel and make it easier for you to take off. Wait about 30 minutes, and your enamel will be hard enough to brush safely. Water is great for your teeth in a myriad of ways. First, whenever you drink water, it actually rinses your mouth and washes away plaque and leftover food particles. Occasionally rinsing your mouth out is the next best thing to brushing your teeth. Your mouth can become dry for a number of reasons, including hot weather and exercise. This means that you don’t have enough saliva in your mouth, which is essential for fighting bacteria. Drinking water can help restore the right balance to your mouth and protect them from decay. Basically, whenever you’re thirsty, drink water! Even someone who brushes and flosses religiously still misses many parts of their teeth. There are many hard to reach surfaces in your mouth, and only a professional dental cleaning from your family dentist in Ocala, FL can address them. These trouble spots in particular are often where tooth decay can start unnoticed. After your cleaning, Dr. Weldon can quickly examine your teeth and spot any signs of tooth decay or gum disease, which enable him to treat it early and conservatively. This will prevent your teeth from have more problems in the future. There are plenty of other things you can do to make your teeth stronger every day, so feel free to call us today and ask. We’re happy to help you keep your teeth looking great in and out of the office, and these 5 simple tips will go a long way in making your smile sparkling for years.